The Free Edition of the hyper Content & Digital Asset Management Server is available for download right here. The nightly build for developers can be downloaded from Bitbucket. Use this version only for development purposes and not for production. Please use Bitbucket to report issues. The package can be easily installed using the one step installation procedure. Just follow the instruction in the included readme file and visit our Youtube Channel to see more screencasts. It's simple! Just overwrite the existing installation in the directory "hypercms". Don't delete anything! You don't even have to stop the webserver. The rest of the update process will be taken care by the system after your next login. 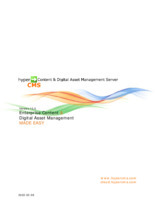 A brief overview about the features of the hyper Content & Digital Asset Management Server. Please watch the installation tutorial before installing.